Like us humans, most insects take shelter when it rains. 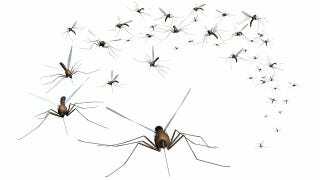 Mosquitoes, on the other hand, in their endless quest to make life miserable for everybody, have evolved a very special way to stay airborne, even during a downfall. A new study suggests their technique has to do with their very special exoskeleton and low mass — a fortuitous combination that renders them impervious to falling raindrops. To put this achievement into perspective, a single raindrop can weigh 50 times more than a mosquito. "If you were to scale up the impact to human size we would not survive," says lead researcher David Hu, "It would be like standing in the road and getting hit by a car." Hu's research, which is being done at Georgia tech with assistance from his doctoral student Andrew Dickerson, has revealed that mosquitoes receive low impact forces from raindrops because the mass of mosquitoes causes raindrops to lose little momentum upon impact. In order to reach this conclusion, Hu used high-speed videography to watch mosquitoes in action. He and Dickerson constructed a flight arena consisting of a small acrylic cage covered with mesh to contain the mosquitoes but permit entry of water drops. The researchers used a water jet to simulate rain stream velocity while observing six mosquitoes flying into the stream. Amazingly, all the mosquitoes lived. To survive the collision, mosquitoes must eventually break free from the front of the raindrop. They achieve this by using their long legs and wings, whose drag forces act to rotate them off the point of contact. This is necessary, otherwise mosquitoes will be thrown into the ground at the speed of a falling raindrop. Essentially, it's their lanky physiology which allows them to avoid having to resist the downward pull of the water. They just go with the flow, quite literally. The results of their work will appear in the June 4 issue of the Proceedings of the National Academy of Sciences. Hu's findings could be used to enhance the design and features of micro-airborne vehicles and robots, which are increasingly being used by law enforcement and the military in surveillance and search-and-rescue operations. Via. Image via Shutterstock / Linda Bucklin.